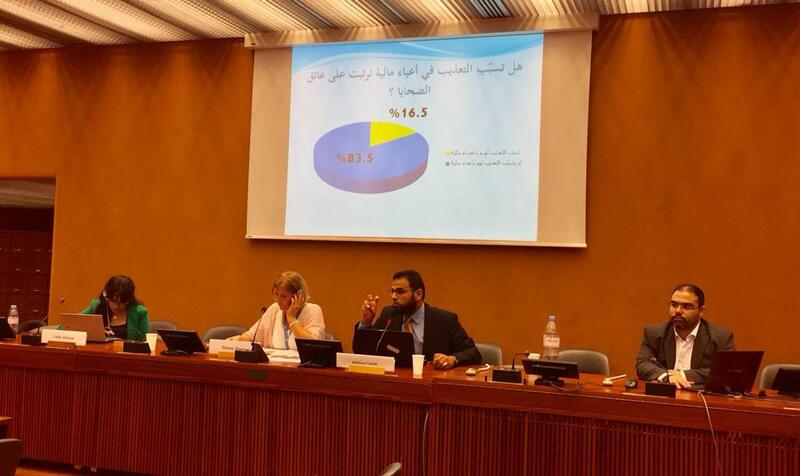 Geneva – A seminar discussing the situation of civilians in the Middle East was organized on the side-lines of the Human Rights Council’s 39th session by the Euro-Mediterranean Human Rights Monitor and other non-profit watchdog groups. During the seminar, Euro-Med Monitor called for international prosecutions of those responsible for violations in Palestine, Libya, and Iraq. The organization also called for protecting victims, putting an end to impunity, and establishing an international mechanism to support victims of conflicts. The seminar was held on Wednesday, 19 August in Geneva, and was organized by four international organizations: the International Bar Association, the International Organization for the Elimination of All Forms of Racial Discrimination, the Euro-Mediterranean Human Rights Monitor and the Geneva International Center for Justice. Alaa Barghouthi, Euro-Med’s researcher, reviewed the organization's report findings on the violations of the Israeli authorities in East Jerusalem. He also mentioned measures taken by the Israeli authorities against Palestinians, including arbitrary detention (which includes beatings and interrogations for long hours), fines, and house demolitions on the pretext of non-authorization, or lacking a license. Barghouti also mentioned the escalating bans on Jerusalem residents, barring them from visiting Al-Aqsa Mosque without any justification. The violations against Palestinians in the Holy City escalated after relocating the American Embassy from Tel Aviv to Jerusalem, Barghouthi said, pointing out that the Israeli security services issued removal orders from Al-Aqsa Mosque against Palestinians by using five basic methods, military orders, judicial decisions, decisions by the police commander, decisions by interrogation officers and the blacklist. Concluding his speech, Barghouti called on the international community to exert every effort to end the Israeli violations in Jerusalem. He also urged the Israeli authorities to stop their policy of bans on Palestinians wishing to visit Al-Aqsa Mosque. Mahfouz Touati is a Euro-Med’s researcher who is involved in documenting cases of torture as part of a project co-launched by Euro-Med Monitor in Libya. Touati spoke about the main documented violations against civilians, stating that within the first two months of the project, 500 cases of torture were documented. He also said that the number of documented cases would reach 1,500 cases to cover the last seven years, pointing out that the most used methods of torture are beatings, insults, verbal violence, firecrackers, sexual assault, electric shocks, and many others. 65% of the torture cases were caused by government bodies, while the rest were by armed groups across Libya, Touati explained, pointing out that the report indicates only 36% of torture victims spoke about their cases. In addition, 70% of the victims' families suffered physical and psychological traumas due to the torture of their parents. The victims of torture in Libya need support and assistance, including by intensive psychological rehabilitation, to remove the effects of psychological torture inflicted on them. They also need treatment from physical harm and health-related problems. Families of the victims also need psychological support, especially children, in order to overcome the psychological suffering resulting from torture of their parents, Touati said. Victims should be integrated into the community after their psychological rehabilitation by providing rehabilitation on a case-by-case basis, stressed Touati. On the situation in Iraq, Ghada Al Rayyan, Euro-Med’s researcher, called on the international community to take all necessary measures to ensure the protection of the right of Iraqis to peaceful assembly and to pressure the government to stop the targeting of human rights defenders, journalists and activists. Al Rayyan also called for the establishment of an international independent commission of inquiry to investigate all violations committed in Iraq since 2003. Speaking about the recent peaceful popular protests taking place in several central and southern Iraqi governorates since early July, Al Rayyan said that protesters expressed their frustration due to the lack of jobs and basic services, including water and electricity. Instead of using force to dispel protests, the government should have responded positively to the rightful demands of citizens. A team from Euro-Med Monitor and the Geneva International Center for Justice documented the use of excessive force by the Iraqi authorities while dispersing protesters, in addition to carrying out arbitrary arrests of hundreds of them as well as practicing torture and enforced disappearance, added Al Rayyan. Iraqi security forces used live ammunition while cracking down on protests in Iraq in the past two months, killing at least 18 people, most of by live bullets. Although Iraqis have a constitutional right to freedom of peaceful assembly, this right is often subject to restrictions. The Iraqi authorities continue to suppress peaceful demonstrations organized by civilians against corruption and demanding greater civil and political rights. Regarding the freedom of the press in Iraq, Al Rayyan explained that Iraq has become the most dangerous place for journalists. They are facing murder, prosecution and arrests, while the Iraqi government and active militias continue to arrest journalists and human rights defenders. 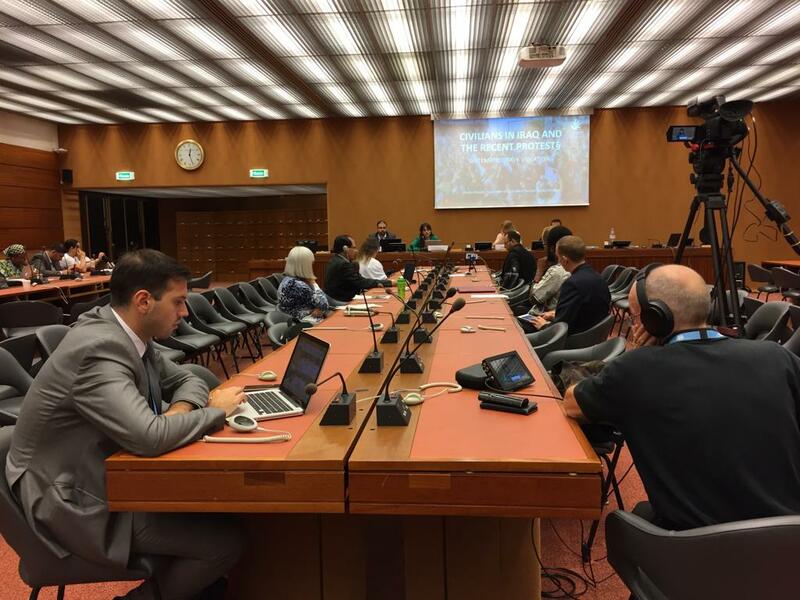 Concluding her speech, Al Rayyan urged the Special Rapporteur on the promotion and protection of the right to freedom of opinion and expression to visit Iraq and to examine the ongoing violations closely. Dani Dugnes, head of Scale for Justice, criticized the Israeli authorities' continued policy of annexing the Palestinian Territories and separating the Palestinian population and cities through the separation wall, which is illegal under international law. She spoke about her experience in the Occupied Palestinian Territories and her monitoring of dozens of house demolitions, especially in the village of Walaja in the West Bank. The village is currently facing at least 50 demolition orders. Meanwhile, hundreds of civilians will be left homeless. The international community is aware of most of these violations, but it is not doing enough to counter the Israeli measures aimed at eliminating any Palestinian presence in the Occupied Territories. Concrete steps must be taken to counter these measures and limit violations so that Palestinians can enjoy basic rights.